​Kotzia Square, in central Athens, retains several characteristics of 19th century neoclassical architecture including the Athens City Hall. The square is surrounded by Efpolidos Street to the north, Athinas Street to the west, Kratinou to the south, and Aiolou Street from the east. Several hotels are located near the square. 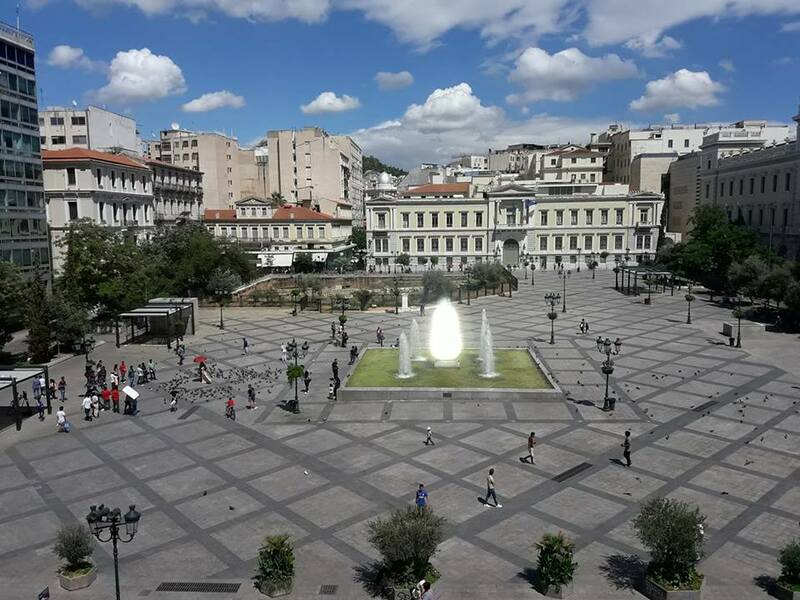 The square itself is south of Omonia Square ​and north of Monastiraki. Kotzia Square, as seen from the City Hall. 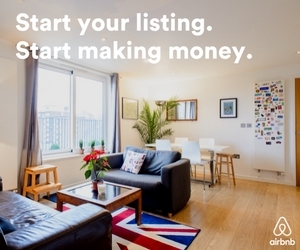 Photo Credit: Andreas Varelas. Built in 1874, the square was formerly known as Loudovikou Square. During the 2004 Summer Olympics, it served as the start and finish venue of the Athens historic center circuit for the men's and women's road race events, as well as for various artistic events. In the middle of Kotzia square classical antiquities have been recently uncovered that include a large part of an ancient road, tombs, parts of the city's ancient fortification and a small building. 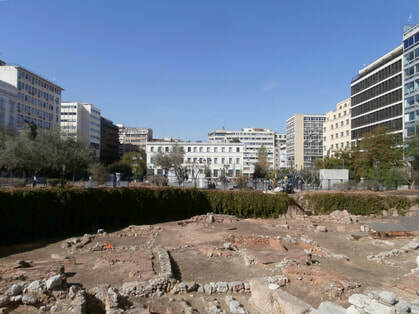 The square is situated just outside of the ancient Acharnian Gate of Classical Athens, and a section of the Themistocleian walls has been uncovered. ​The City of Athens Town Hall, at 63, Athinas Street, was constructed in 1874 in a neoclassical style. Originally a two-floor building, in 1937 one more floor was added and the building was modified due to the increased space requirements of the Municipality. In the interior one will find the paintings of known Greek painters of the 19th century, and murals of Fotis Kontoglou with representations of mythological and historic themes (1937-1940). The visitor will also find a large oil painting depicting St. Paul the Apostle teaching the Athenians the Christian religion (1877) in the Municipal Council hall. In the reception room (1st floor), you will find in special glass-showcases, small terra-cotta figures representing all the mayors of Athens. In the vicinity of the municipality is the attractive, small, Theatrou Square. 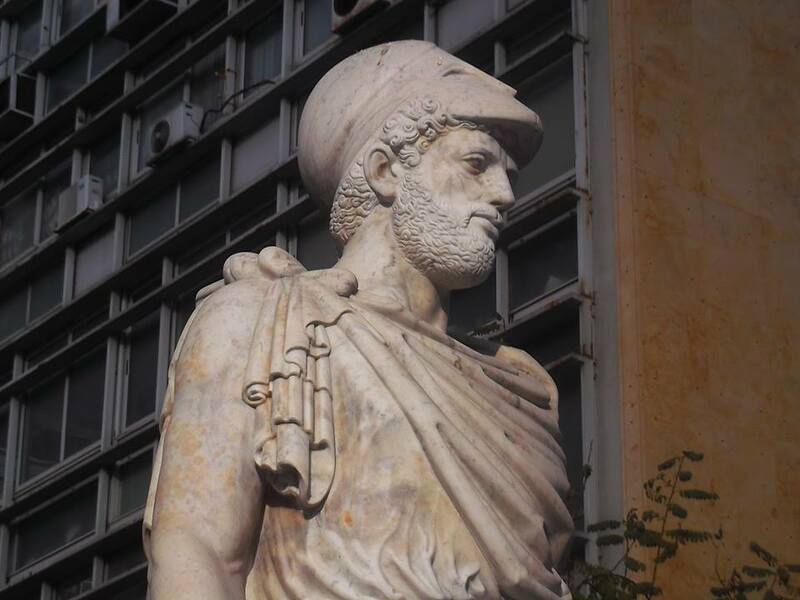 Head from the statue to the statesman Pericles, by German sculptor Heinrich Faltermeier, in marble, located by the Town Hall on Kotzia Square. Photo courtesy John Vellis. In the vicinity of Kotzia Square, we recommend Hotel Fresh. This design hotel offers luxurious, stylish rooms, in vivid colors. Most units feature balconies, some with a Zen garden. Hotel Fresh stylish rooms feature furnishings and fittings by designers such as Philip Starck and Artemide. The spacious rooms are soundproofed and equipped with LCD satellite TVs and free Wi-Fi access. Toiletries and slippers are standard. Wellness options include a sauna, a state-of-the-art fitness center and hamam. On the rooftop of Hotel Fresh, the outdoor swimming pool offers views to the Parthenon and the city. Guests can enjoy a full breakfast buffet in Magenta Restaurant. The Rooftop Lounge Bar-Restaurant serves Mediterranean specialties in an informal environment and offers skyline views by the pool with the Acropolis in view. Kotzia Square. The archaeological site looking towards the City Hall. of ancient Athens during this 2.5-hour walking tour. You’ll visit the culturally invigorating Kotzia and Monastiraki squares, and discover the historic significance of the Acropolis of Athens. 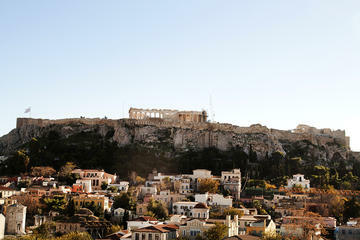 Get an exclusive insider’s experience to the city with an expert guide who knows hotspots, as well as Athens' history. Limited to 12 people for an intimate experience.